The On Campus Exhibition Program offers an ongoing exhibition program to staff and students of Griffith University. Works from the Collection are selected for display throughout the University’s building and environs, in a program designed to foster an appreciation for contemporary art. Approximately 14% of the Collection is on display at any one time, displayed throughout fifty buildings across the five Griffith University campuses. Our policy directive is to put artwork in relatively high-traffic zones so the work is seen by as many people as possible, and contribute to an atmosphere where works from the collection become part of an everyday experience for students and visitors to the campuses. Griffith University Art Museum offers a dynamic range of public programs, including artist and curator talks, panel discussions, workshops and masterclasses. Our annual program also includes a special series of In Conversation events with some of the country’s most active collectors and philanthropists. We also hold children’s workshops throughout the year, and cater to children from five through to eighteen years of age. Our Children’s workshops are held throughout the year, and cater to children from five through to eighteen years of age. 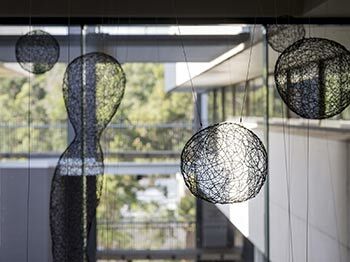 Griffith University Art Museum welcomes visits from schools, universities and community groups. Our staff can provide free introductory talks and exhibition tours as required. Contact us via email to book a visit. Education Kits for teachers and students are available for download as applicable. They can be used before, during or after your visit.